In the previous blog post we learned how to get available sources for a Maven dependency. We can also get Javadoc for the library. The Javadoc must be available of course otherwise NetBeans is not able to download anything. 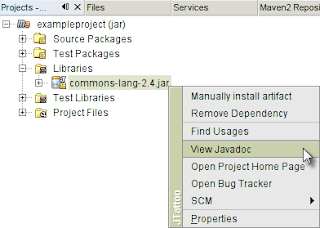 We right-click on Libraries in our project and select Download All Library Javadoc. 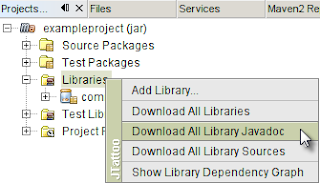 NetBeans downloads the Javadoc for the libraries if it is available. The icon will change for the library if Javadoc is downloaded. 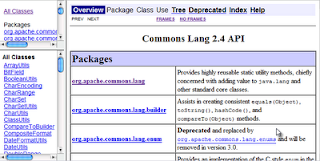 To view the Javadoc we must right-click on the library and select View Javadoc. NetBeans opens a web browser with the Javadoc for the specific library.